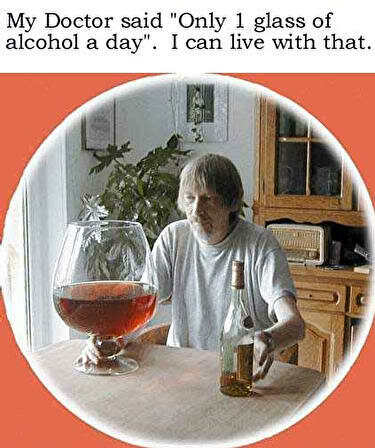 What is it with people who drink too much? Why do they take leave of their senses? I've seen enough stories of stupid drunk people lately that if I taped them I'd have a TV spin-off titled America's Funniest Blottos. A couple of weeks ago I related the tale of two Aussies who shot each other in the buttocks after a heavy session with silly pops because they wanted to know if it would hurt. Well turns out they aren't alone in the "I wonder what would happen if..." society. That was in Australia last week. This week in the land down under some guy got kicked out of a pub and thought it would be a good idea to jump the fence of a wildlife centre and ride a crocodile. Sure I would have done the same thing...not. This wasn't any crocodile, but a 16 foot, 1800 pound man-eating croc called Fatso. "Hello, honey, I'll be a little late home from the pub. Yeah, I just saw this crocodile I absolutely have to ride." Somehow, this idiot got away and went back to the pub where they called an ambulance. Crocodile Drunkie underwent surgery for severe lacerations. I hope they examined his head while they were at it. 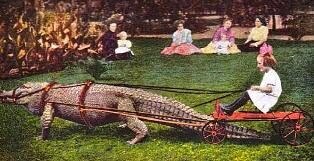 The proper way to ride a crocodile. Meanwhile, in New Mexico this week a group of guys from the American chapter of the "I wonder what would happen if..." society bet each other - now get this - that of the three of them, whoever drank the least would be set on fire by the other two. Now there's an incentive for you. There's always gonna be a loser in these things and sure enough at only 6 beers under his belly, one guy lost. 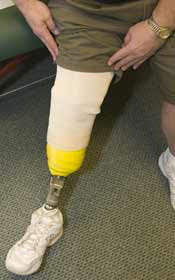 Now this guy was actually lucky because he had a prosthetic leg and that's what his buddies set on fire. I guess they thought it would burn better. Then, realizing he was in pain from their pyro prank they decided to take him to the hospital but changed their minds and dumped him in a ditch by the side of the road. I can just see the cops asking him if he'd been drinking. If he tried to deny it, the poor guy wouldn't have a leg to stand on. It may be awhile before this guy's able to put his best foot forward. You know these days, it's not enough to say if you drink don't drive. That slogan should be changed to if you drink don't think! National Study: Alligators dangerous no matter how drunk you are. The Onion wouldn't lie! Sage advice from a mother to her son. CL: Sage, indeed. That guy in Australia could have sure used you...and your advice. Amazing what kind of mental metamorphosis people go through when drunk. I've seen a lot of different stages from the sublime to the outrageous, and I can tell you they don't feel good. Dang! Reason 1,545,683,299 to not imbibe! Thanks for the praise shout-out! Don: I knew I could count on you to personally validate the hi-jinks of people under the influence. Quirks: yep, better stick to your diet Dr.Pepper. And, hey, you noticed my sidebar! Your name links to your blog! Thanks for the kind words. Guess that's why they call it getting legless. sharkguy: Hey, haven't seen you round these parts in eons. Welcome. Well, the Aussie guy almost ended up legless, that's for sure. When I was in college I spent a couple hours in a bar each week. It wasn't uncommon for college kids to get a bit too drunk and then start fighting... which was a stupid thing to do as the bar I'd frequent was right across from the police station. The fights didn't last too long. Once a guy misdirected a punch and caught a lady cop in the throat. Then the fun began. Canadian Blend: The bar was right across from the police station? I bet their cells were over"flowing" with drunken kids. 00dozo: Well, you're here now. Cheers! Reason 1,545,683,300 not to drink? (This one is after Quirky's) : Mel Gibson. KABLOOEY: If Mel's rants were when he was sober, I'd sure hate to see him drunk. Shouldn't people like this be extinct already? Darwin doesn't nearly work fast enough. Good thing he has Fatso to help him out, though! Ziva: These guys are wannabe members of the Darwin society. Another stupid turn or two and they'll become honorary members.